Annamaria Papayova is the winner of Focus/17’s Blogging Award, given to the blogger who best captures the spirit and themes of the event. 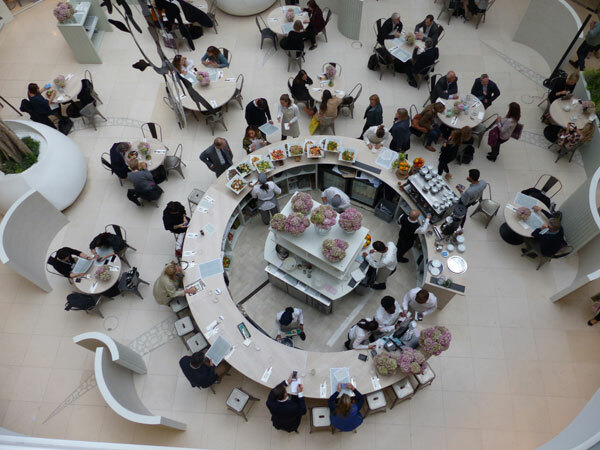 The concept of ‘360 Degrees of Design’ was at the heart of Annamaria’s perceptive post (read it here); she covered it all, from Tony Marklew’s floral displays to Access All Areas showroom happenings and innovative new launches. 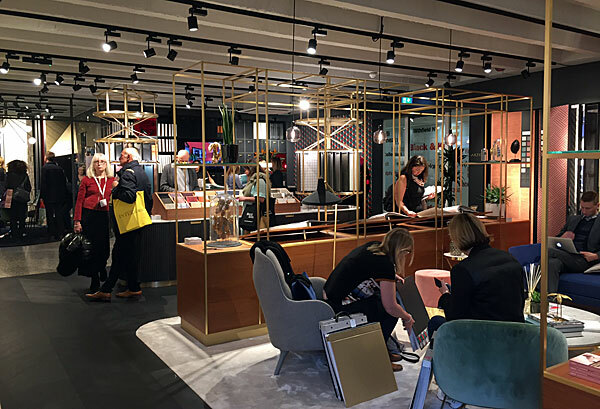 The award was judged by Jenny Gibbs, principal of KLC School of Design, interior designer Samantha Todhunter and Grant Pierrus from design blog Interior Style Hunter. The judges felt that, besides Annamaria’s infectiously enthusiastic response to the show, she also kept a strong and distinctive voice throughout; they also praised her photography and strong visual sense. 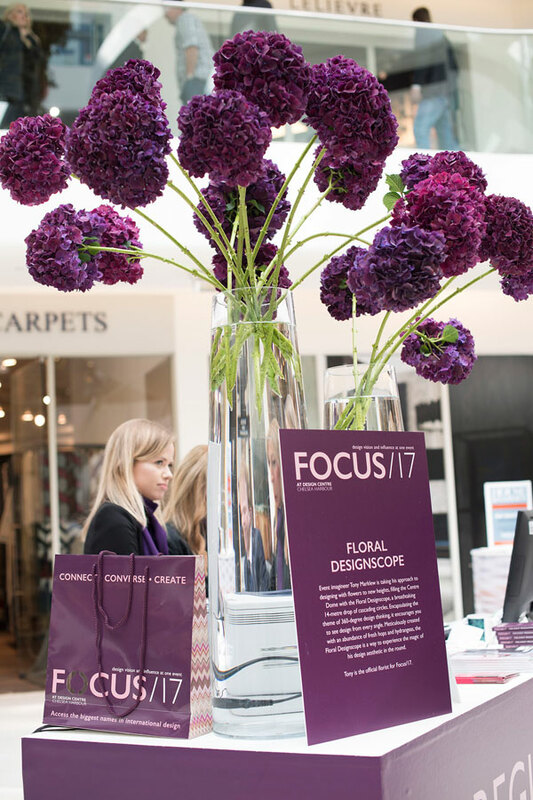 Tony Marklew’s romantic, sensual way with floristry is being felt all over Design Centre, Chelsea Harbour at Focus/17. 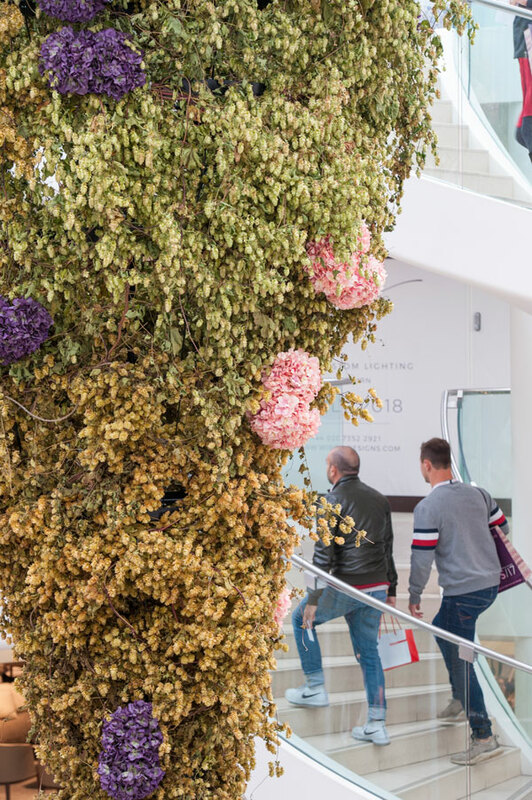 Dominating the Centre Dome is the DesignScope, featuring tumbling tiers of hops studded with pink and purple hydrangeas. 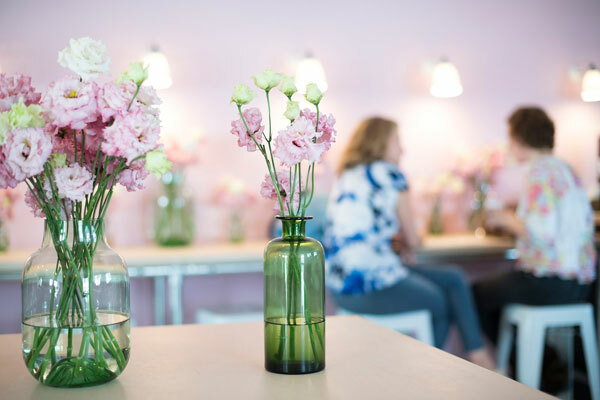 Elsewhere, a single type of flower arranged abundantly proves that simplicity speaks volumes: a new variety of purple hydrangea – never available commercially until now – fills the Centre Dome; in the new Third Floor Food Market, pretty ruffled lisianthus look fresh in green vases; while a line of bowls of pink roses topped the central bar at Tom’s Kitchen at the Tatler Restaurant. “I’m constantly surprised at how many different companies, styles, interests and innovations are available, all under one roof,” says Zoffany’s head of design. 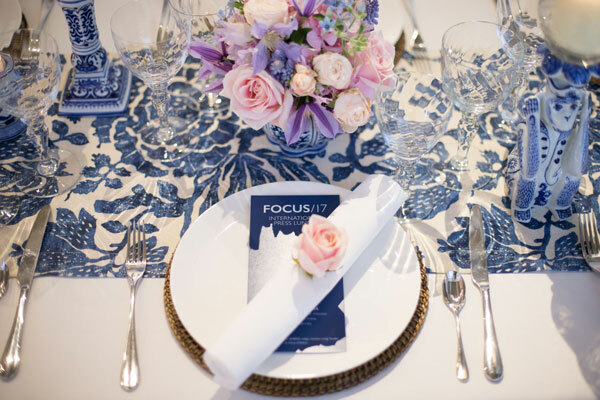 Focus/17’s daily Discovery Tours offer the chance to take in the latest showrooms and get a more personal, curated take on the new collections, all accompanied by knowledgeable concierge Maggie Eccles and a glass of fizz. 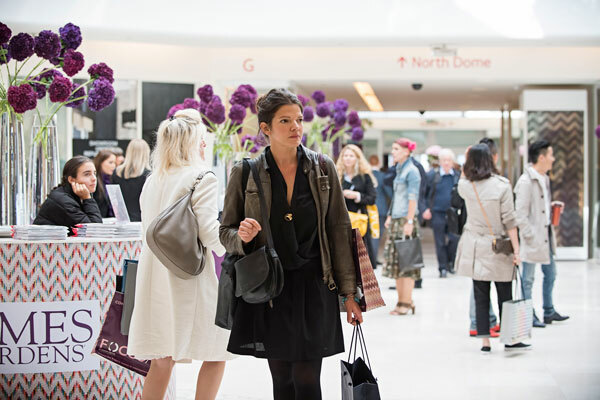 Six showrooms are visited during the hour-long sessions, including Design Centre East newcomers Villeroy & Boch, Siberian Floors and Lacaze London, and the new Design Space on the Third Floor of the South Dome, which houses Altfield, Jim Thompson and Wired Custom Lighting among others. There’s no better way to get the inside track. 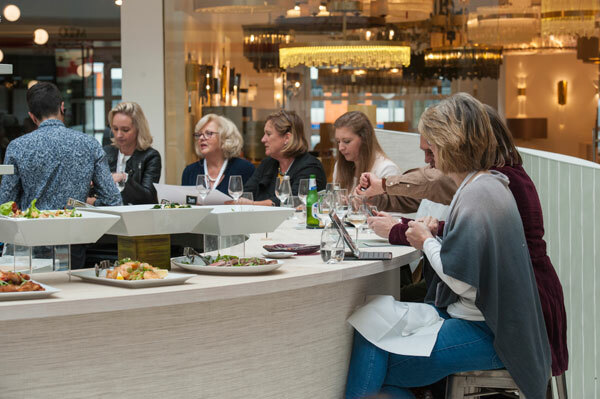 “The Design Centre fosters the design community; it’s very friendly and it always works together,” says the editor-in-chief of Homes & Gardens. The South Dome Deli is a new meeting and eating point at Focus/17. 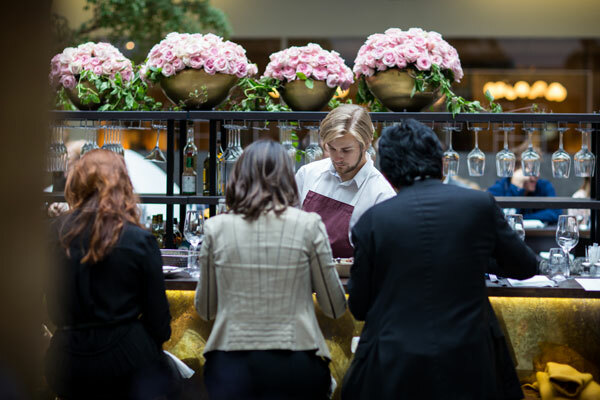 This all-day-dining destination features a counter packed with mouthwatering salad plates that look as good as they taste, including broad bean, puy lentil, tomato and goat’s cheese, and quinoa and roasted vegetables, plus healthy sushi and sashimi. The decor has a similar lightness of touch, with serene pale green paint from Zoffany at Style Library; the wallcoverings are ‘Grasseffects’ from Brian Yates and ‘Marquee Stripe’ by Cole & Son. “When you get to meet someone face to face, you feel a real connection with them,” says the interior designer.